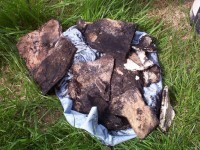 Every year chimney fires cause millions of dollars in damage in America and around the world. You can do your part to help keep your family and your home safe by having your chimney inspected by a professional at least once a year. If you burn any solid fuel, your chimney should be inspected and serviced as needed during the burning season or at least annually. 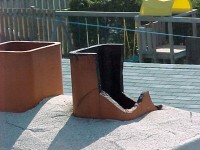 Chimneys venting oil and gas appliance's should be inspected annually and are recommended to be serviced as needed. Company owner Mark Ferraiolo has a lifetime of experience in the various building trades, is a Certified Master Chimney Technician™ a Certified Chimney Reliner™ and a member of the Pennsylvania Guild of Professional Chimney Sweeps. We are fully insured, licenced and provide quality professional service with guaranteed customer satisfaction as illustrated by our many five star reviews. We are punctual and treat every customer as if they were our only customer. Calls to our office are always returned at the end of each business day. Please scroll down to see the areas we currently serve. NOTICE: Due to the high cost of operating a business please be aware that if you schedule an appointment with us for any type of service or estimate and no one is home when we show up, you will be billed a service call charge. No further appointment will be scheduled until that bill has been paid. While most people never give a thought to the condition of their chimney, here are some photos which will give you an idea of what some of the warning signs are which could indicate that your chimney is not safe or in need of repair. Do you see any of these conditions where you live or work? While it is imperative to have your chimney inspected and or serviced every year when burning any solid fuel, many people who heat their homes with oil or natural gas and don't burn solid fuel in their home think they need not be concerned with the condition of their chimney. Most people don't realize that one of the many by-products of the burning of heating oil is sulfuric acid which is extremely corrosive to all masonry products. Natural and LP gas when burned produces hydrochloric acid and also produces approximately twice its volume in water vapor. These by-products are also extremely corrosive and damaging to masonry products and unfortunately a great many masonry contractors over the years did not use the correct mortar when laying up the flue tile system inside the chimney structure. 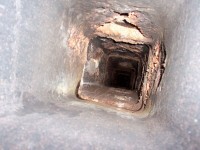 Even a chimney which is lined with a clay flue tile liner system and was built using the correct mortar on the flue system is subject to premature failure from these acids as illustrated in this photo of the remains of several sections of clay flue tile liner removed from the bottom of a chimney venting an oil furnace. When this happens, the chimney is no longer able to properly contain the gasses of combustion which will eventually lead to premature failure of the exterior chimney structure. The homeowner may also be in danger of deadly carbon monoxide entering the home especially if the chimney runs up through the structure rather than on the outside of it. The most cost effective, speedy and permanent solution to all of these issues is to have a high quality stainless steel chimney relining system installed. We install only the highest quality chimney liners and caps available. We don't believe your chimney is the place to cut corners. All chimney liner systems and chimney cap/spark arresters installed by Home Saver Chimney Sweeps carry a "Forever" warranty (terms and conditions apply). 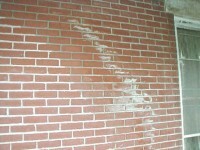 Another very common problem with all masonry chimneys is that they are prone to water penetration. In some cases this could be due to improper construction techniques but is normally related to time and the elements. Think of your masonry chimney as a sponge which will eventually (even when new) absorb a certain amount of water. When the amount of water penetration exceeds what is considered to be normal, gravity takes over and the water will eventually find it's way down and into your home. While the brick walls on most houses are somewhat protected from the element's by the sofit or overhang of the roof system as well as their geographical location, the chimney normally rises above everything else and is subjected to all the wind, rain, heat and cold that nature can throw at it 24 hours a day 7 days a week! The fact is that even the highest quality brick and mortar used to build a chimney will only last so long and will eventually deteriorate and leak without proper preventative maintenance. The solution? Saver Systems® weather proofing products. These are the highest quality masonry treatment products available which are specifically designed for use by the chimney service industry. These products have been scientifically proven to out perform anything else on the market when it comes to the prevention of water penetration into a masonry structure. When dealing with leaky chimney issues we can conduct an on site evaluation in order to determine if your chimney is in need of waterproofing. We will then demonstrate the effectiveness of the product and make recommendations which will allow you to make an informed decision concerning the appropriate course of remedial action. The old saying "An ounce of prevention is worth a pound of cure" certainly fits when it comes to chimney maintenance. The following is a list of the cities and towns we currently serve. If your town is not listed here a call to our office will not be returned. Williamsport, Montoursville, Muncy, Duboistown, Pennsdale, Hughesville, Montgomery, Watsontown, Turbotville, Unityville, McEwensville, West Milton, Milton, Lewisburg, Northumberland, Washingtonville, Jerseytown, Danville, Riverside, Millville, Orangeville, Benton, Stillwater, Buckhorn, Bloomsburg, Rupert, Mainville, Numidia, Catawissa, Shickshinny, Berwick, Sugarloaf, Conyngham, Drums, Wapwallopen, Mifflinville, Lightstreet, Snydertown, Paxinos, Sunbury, Elysburg, Selinsgrove, Shamokin, Shamokin Dam, Kulpmont, Mt Carmel, Aristis, Natalie, Trevorton, Hummels Warf, Dornsife, Middleburg, Kissimmee, Kreamer, Freeburg, Penns Creek, New Columbia, New Berlin, Kratzerville, Mifflinburg, Winfield, Marion Heights, Rock Glenn, Nuremburg, Ringtown, Brandonville, Shenandoah, Shenandoah Heights, Ashland, Frackville, Hometown, Tamaqua, Gilberton, Giradville, Barnsville, New Boston, Morea, Gordon, McAdoo, Zion Grove, Sheppton, Oneida, Delano. You've worked hard to provide a home for your loved ones. When it comes to chimney safety, please don't put it off. Have your chimney inspected annually and correct any problems as soon as they are discovered. You'll be glad you did!